Obviously, I super love tacos, I mean seriously who doesn’t? I go out for tacos at least twice a week, it’s one of my favorite lunch time options. This week I got a craving for Wahoo’s Volcano Bowl and headed straight there. You may be asking yourself, what is a Volcano Bowl, why isn’t it on the menu? Well is the best thing ever and I have no idea why it isn’t on their menu. It’s your choice of protein cooked teriyaki style and then tossed in their Mr. Lee chili hot sauce. It’s sensational and I’m so glad Wahoo’s locations everywhere have never denied me this deliciousness. Ok, I’m getting off topic, back to the tacos. So I arrived at Wahoo’s all ready for my usual spicy treat, but of course, I’m easily distracted and a sucker for a seasonal menu so I had to look to see what Mango-licious month was all about. 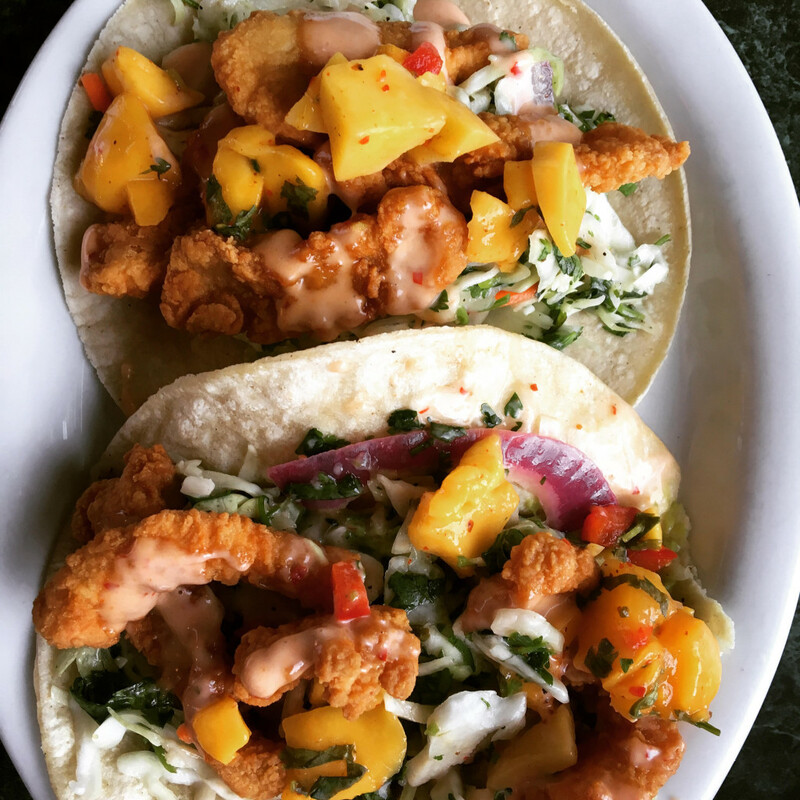 The menu started off with fried calamari tacos with mango, citrus slaw and guacamole drizzled with some yummy sauce. Whatever didn’t matter to me they had me at calamari and mango. I debated for one second if I should get the bowl or the tacos and decided YOLO and got both. Best. Decision. Ever! The combination of the crispy and slightly salty calamari paired with the tangy citrus slaw and sweet punch of mango bits of was a literal party in my mouth. I felt like I was at some hip fancy gourmet fusion taco shop, but without the attitude. I can not recommend enough that you swing by Wahoo’s and try these tasty tacos out before they are gone! What else was on the MANGO-licious menu? Teriyaki Salmon served over a bed of field greens topped with avocado, red onion, mango salsa and their island aioli. Two crispy tortillas with pork sauteed in Mr. Lee’s hot sauce on top of citrus slaw, guacamole and of course mango salsa. I can’t wait to go back and try the rest!! !